The complete GS1100 Series comes in a fanless design that ensures silent operation in small or quiet office environments. The GS1100-8HP and GS1100-10HP PoE models are specifically designed with an external power adapter that eliminates the need for an additional fan to cool down the device, making it perfect for quiet PoE deployments. 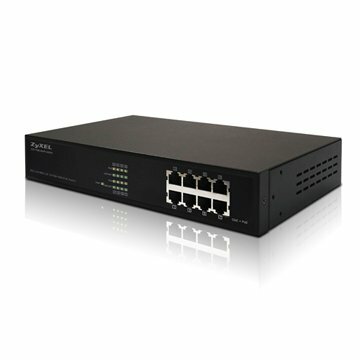 The ZyXEL GS1100 Series offers small offices 8/10/16/24-port Gigabit connectivity at the most competitive price. Additionally, the GS1100-24 and GS1100-10HP models are equipped with 2 extra SFP slots, supported dual rate (100 M and GbE speed) that enable fiber optic connections for long-distance deployments. With Gigabit network performance and high cost-effectiveness, the GS1100 Series is the ideal solution for bandwidth-intensive applications such as high-resolution photo transmission, video/ audio streaming and server farm connections. The GS1100-8HP/10HP supports the IEEE 802.3at PoE Plus standard to ease the installation of network devices in challenging spaces such as ceilings or walls. The power supply of up to 30 watts per port allows the GS1100-8HP/10HP to power PoE-enabled WLAN APs, VoIP phones and IP surveillance cameras through CAT-5 cables without extra power adapters. This feature helps enterprises reduce installation time and cost when there are many such devices on the network. The GS1100-10HP has been designed with eight full PoE Plus ports with total PoE power budget of up to 130 Watts, which makes it an ideal connectivity solution for high-density powered device deployments. In addition, the extra two SFP links on GS1100-10HP also easily extend networks to remote locations such as branch offices and warehouses for small- and medium-size businesses. If you have any questions about this product by ZyXEL, contact us by completing and submitting the form below. If you are looking for a specif part number, please include it with your message.